Textron Systems Marine & Land Systems, a Textron Inc. business, recently announced it has been awarded a US$ 84,087,095 contract option from the U.S. Navy Naval Sea Systems Command for two Next-Generation Landing Craft, Air Cushion (LCAC) Vehicles and associated technical manuals as part of the Ship-to-Shore Connector (SSC) programme. Textron Systems’ Marine & Land Systems will assemble crafts 102 and 103 at its New Orleans Shipyard. Deliveries are expected in the fourth quarter of 2019. SSC craft will serve as the evolutionary replacement for the U.S. Navy’s existing fleet of LCACs, which are nearing the end of their service life. Their mission is to land surface assault elements in support of operational manoeuver from the sea, at over-the-horizon distances, while operating from the U.S. Navy’s Amphibious Ships and Mobile Landing Platforms. Like earlier LCACs, these craft also will be used for humanitarian & disaster relief missions. The new Air Cushion Vehicles, offering increased reliability and availability, are designed for a 30-year service life. They will use more corrosion-resistant aluminum in the hull than current LCACs, as well as composites in the propeller shroud assembly and shafting to increase craft availability and lower life-cycle maintenance costs. These craft also will incorporate an advanced skirt, a pilot/co-pilot arrangement, a cargo deck to accommodate a 74 short ton payload (up to M1A1 Tank), and more powerful, fuel efficient Rolls-Royce Engines. Textron Systems, in July 2012, earned a US$ 213 million contract for the detailed design and construction of the SSC Test and Training Craft (LCAC 100), which is scheduled to be delivered in 2017. The initial SSC contract includes total options for up to eight production craft to be delivered by 2020. 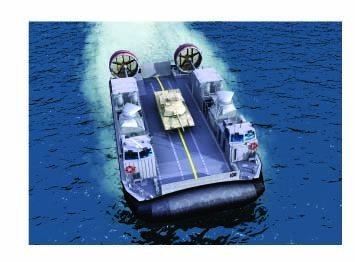 A contract option for LCAC 101 was awarded in August 2014. The SSC programme requirement is for a total of 73 craft (one Test and Training and 72 operational craft). Textron Systems’ businesses develop and integrate products, services and support for Aerospace and Defence customers, as well as civil and commercial customers including those in Law Enforcement, Security, Border Patrol and Critical Infrastructure Protection around the globe. Harnessing agility and a broad base of expertise, Textron Systems’ innovative businesses design, manufacture, field and support comprehensive solutions that expand customer capabilities and deliver value. Textron Systems consists of its Advanced Information Solutions, Electronic Systems, Geospatial Solutions, Lycoming Engines, Marine & Land Systems, Support Solutions, TRU Simulation + Training, Unmanned Systems and Weapon & Sensor Systems businesses. Textron Inc. is a multi-industry company that leverages its global network of Aircraft, Defence, Industrial and finance businesses to provide customers with innovative solutions and services. Textron is known around the world for its powerful brands such as Bell Helicopter, Cessna, Beechcraft, Hawker, Jacobsen, Kautex, Lycoming, E-Z-GO, Greenlee, and Textron Systems.